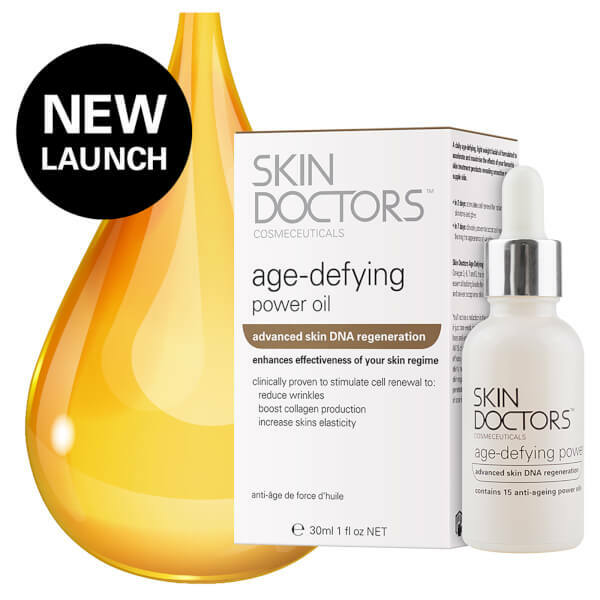 Improve the appearance of skin with Skin Doctors Age-Defying Power Oil, a lightweight anti-ageing facial oil that tackles signs of ageing while enhancing the effectiveness of your usual skincare regime. A cocktail of 15 powerful oils have been hand-selected for their rich composition of Omegas 3, 6 and 9, key vitamins A, C, D and E, essential fatty acids and antioxidants. Working in synergy, the nourishing concoction accelerates and maximises the effects of your skincare regime while reducing signs of ageing in just one week, including fine lines and wrinkles. Deeply penetrating, the solution promotes smoother, supple-looking skin and helps to improve elasticity and the natural moisture barrier while defending against external aggressors. Congested, irritated skin is left feeling smooth and balanced, and scarring may appear improved. The complexions feels brighter, tighter and hydrated. Caprylic/Capric Triglyceride, Rosa Canina (Rosehip) Fruit Oil, Vaccinium Vitis-Idaea (Red Alfa Lingonberry) Seed Oil, Coco-Caprylate, Hippophae Rhamnoides (Sea Buckthorn) Seed Oil, Jojoba Oil/Macadamia Seed Oil Esters, Prunus Amygdalus Dulcis (Sweet Almond) Oil, Simmondsia Chinensis (Jojoba) Seed Oil, Macadamia Ternifolia Seed Oil, Isopropyl Palmitate, Oenothera Biennis (Evening Primrose) Oil, Mauritia Flexuosa (Buriti) Fruit Oil, Helianthus Annuus (Sunflower) Seed Oil, Tocopherol (Vitamin E), Passiflora Edulis (Passionflower) Seed Oil, Squalene, Salvia Hispanica (Chia) Seed Oil, Lecithin, Bertholletia Excelsa (Brazil Nut) Seed Oil, Eucalyptus Dives Leaf/Twig Oil, Cymbopogon Schoenanthus Oil, Arnica Montana Flower Extract, Calendula Officinalis Flower Extract, Citrus Aurantifolia (Lime) Oil, Water (Aqua), Phytosteryl Macadamiate, Backhousia Citriodora Leaf Oil,Swertia Chirata Extract, Rosmarinus Officinalis (Rosemary) Leaf Extract, Phytosterols, Limonene, Geraniol, Linalool.